Former France Under-21 midfielder Younousse Sankhare has pledged his international allegiance to Senegal. The 25-year-old, who plays his club football in France for Guingamp, is eligible to play for the Teranaga Lions because his parents are Senegalese. Under Fifa rules, he is free to switch because he has not yet played for a country's senior national team. Sankhare could be called up by Senegal for next year's Africa Cup of Nations in Equatorial Guinea. "I'm available to play for Senegal if selected," Sankhare told BBC Sport. "Both my parents are Senegalese so playing for Senegal would definitely be an honour for me. "I was born in France and grew up in the country but you can never run away from your root, it's something my parents are always proud of. "If the opportunity to play for Senegal presents itself, I won't think twice to fulfil that desire and that of my family." However, the box-to-box midfielder knows he has his work cut out to earn a call-up or break into the star-studded Senegal squad. "Contrary to media reports in the past, no-one has contacted me directly from the Senegalese federation," he said. "When you look at the players available for Senegal then you know the hard work will be immense to earn a chance to play for the country. "The motivation is huge; to see the passion and desire of the players to excel has inspired me to want to do the same." Sankhare began his professional career at Paris St Germain and spent a decade at the capital club. He had loan stints at Reims, Valenciennes and Dijon before joining the latter on a permanent basis in 2012. 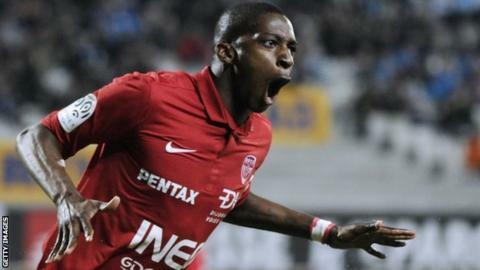 He left Dijon and signed a four-year deal with Guingamp in July 2013 and his impact was immediate as he won the Coupe de France title with the club in 2014. Sankhare has been an integral part of the team in the French League and Europa League this season under coach Jocelyn Gourvennec.